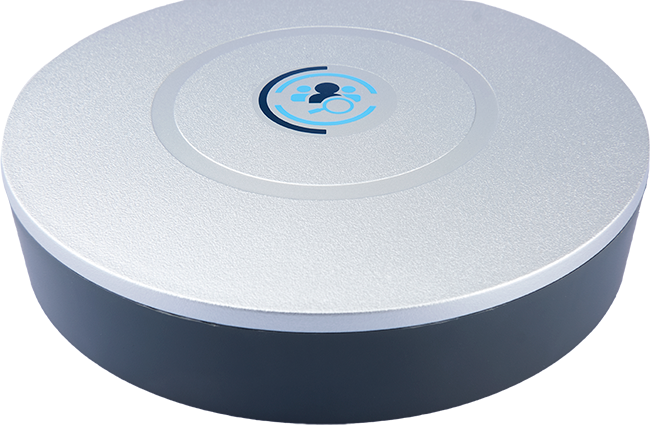 The CentrePoint Data Hub is a home-based communication gateway that securely transmits data captured by ActiGraph activity monitors and other connected health sensors to the CentrePoint cloud software platform via Internet connection or 3G cellular network. The CentrePoint Data Hub reduces the need for frequent site visits, improving clinical trial efficiency and patient satisfaction. 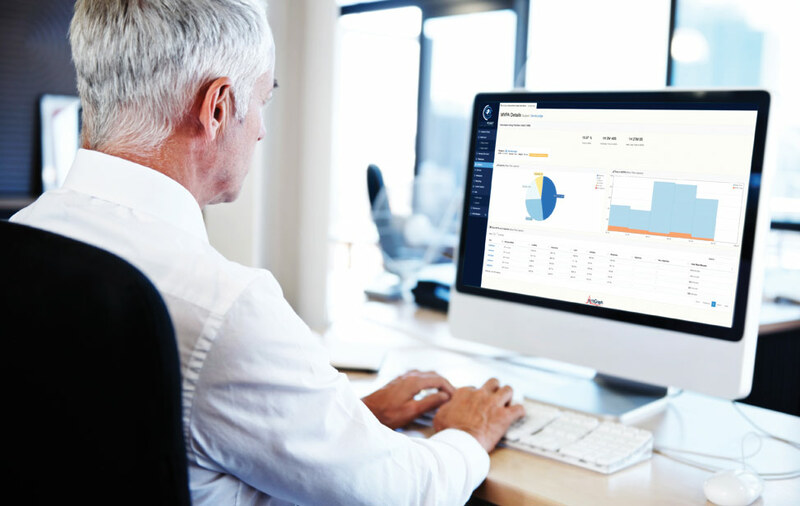 Access to daily compliance reports and activity monitor feedback helps the research team mitigate the risk of data loss, quickly identify potential issues, and make faster, better informed decisions. 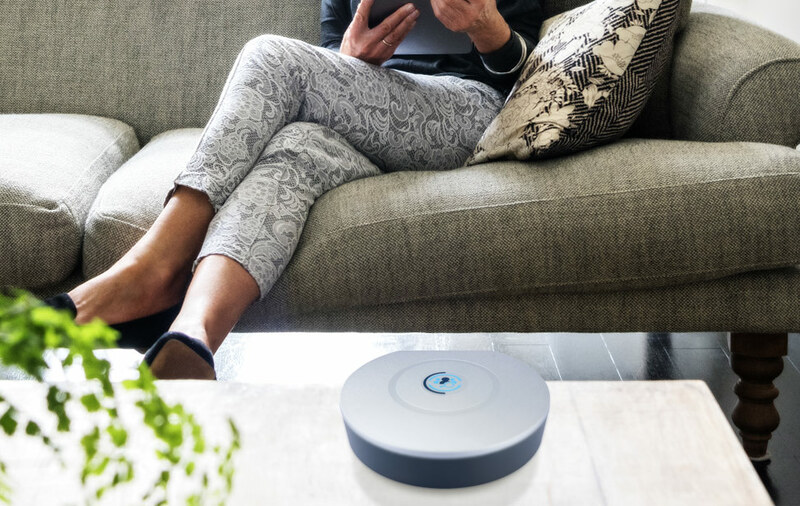 The CentrePoint Data Hub allows patients to share activity and sleep data with the research team from the comfort of home, without the need for a PC, smartphone, or WiFi connection. The Data Hub uses Bluetooth technology to periodically retrieve collected sensor data, so uploads are automatic and effortless for the patient. The CentrePoint Data Hub uses an Internet connection or 3G cellular network to transmit data from the patient’s home to the CentrePoint cloud, and processed measures are instantly available through the CentrePoint web portal. Actionable near real-time data lets the research team quickly intervene if potential adverse events or noncompliance issues arise, while supporting earlier clinical decision making. The CentrePoint Data Hub offers the flexibility to integrate with other types of connected sensors and devices to streamline and simplify the collection of multiple channels of patient data. The CentrePoint Application Programming Interface (API) allows clients to pull patient data from the cloud directly into their own electronic data capture (EDC) platform and user interface. Data transfer from peripheral devices to the CDH is supported by a dual-mode Bluetooth Smart Ready (v.4.0) (Classic and Low Energy) chipset capable of data rates approaching 25 Mbit/s. 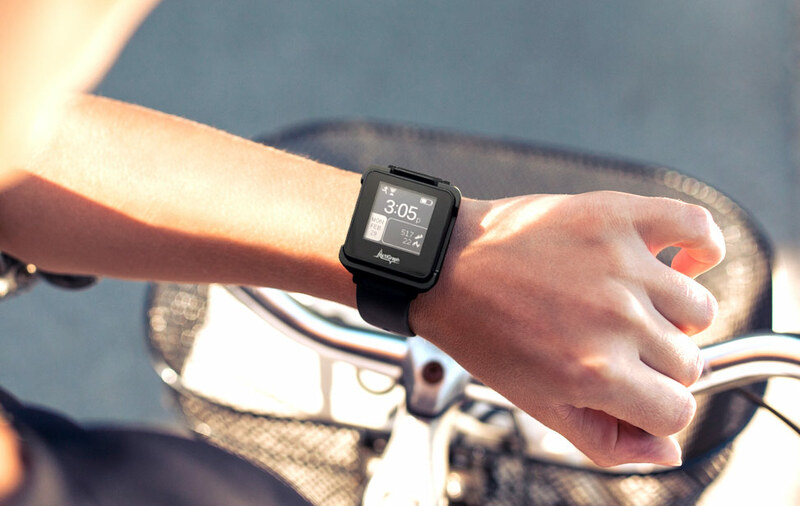 This is sufficient for capturing continuous-time epoch level (1 sample/minute/axis) activity data throughout the day without the need for user interaction. 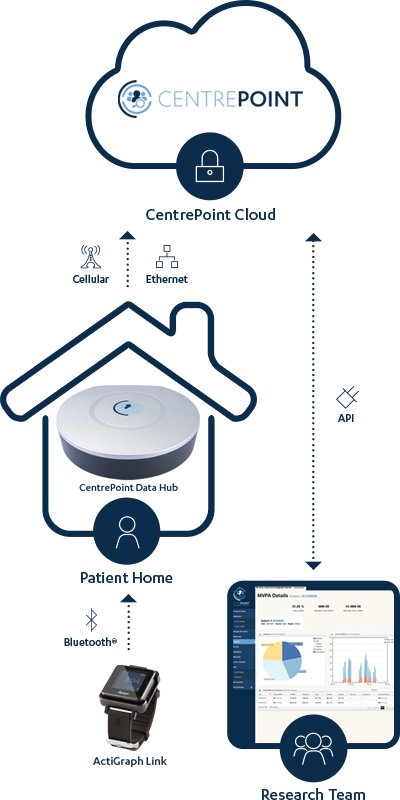 Data collected from in-home peripherals can be transferred via Internet connection or cellular network into ActiGraph’s secure CentrePoint study management system. The CentrePoint Data Hub leverages a global UMTS/HSPA/GSM 3G cellular radio capable of operating on a global scale with supported data-rates of 7.2 Mbit/s (down) and 5.76Mbit/s (up) in an extended operating range of -0 to +60 C. Fallback bands include GSM 850/1900 and 900/1800 MHz; GPRS Class 12 CS1-CS4 (up to 85.6 kbit/s); EDGE Class 12, MCS1-9 (up to 236.8 kb/s); CSD GSM (max 9.6 kb/s); and UMTS (max 64 kbit/s). Certifications and approvals include PTCRB, GCF, FCC, IC, R&TTE, RCM Anatel, and AT&T. Raw activity data (up to 100 activity samples/second/axis) is transferred to the CDH through a USB 2.0 high-speed connection (480 Mbit/s), which is capable of handling the large data payloads generated by ActiGraph’s activity monitors while simultaneously charging the device battery. An optional 10/100 Base-TX ethernet connection enables data transfer via the Internet for non-cellular applications. The CentrePoint Data Hub core processor is a 32-Bit ARM® Cortex®-A8 RISC Microprocessor (IC Sitara™) supporting an embedded Linux OS. * The CentrePoint Data Hub can be paired with the Wahoo Balance Bluetooth® Smart scale to capture and transmit weight to the CentrePoint platform alongside activity and sleep data. 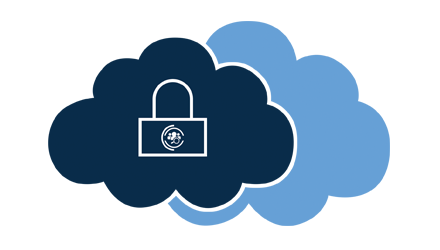 All protected health information (PHI) is encrypted and stored securely in the ActiGraph cloud database. Connections are made securely using PKCS #1 SHA-256 with RSA Encryption. No PII is transferred. Interested in the CentrePoint Data Hub Ecosystem? The CentrePoint Data Hub home-based ecosystem is customized for each study and is priced on a per patient, per term basis. Please contact the ActiGraph Sales team for more information.